Caesar salad is a popular dish in my house. The lovely chicken with different dressings and vegetables give it different ways to eat. Anchovies are not popular in this house, so I never use them, and I tend to use the same sort of things to make it. 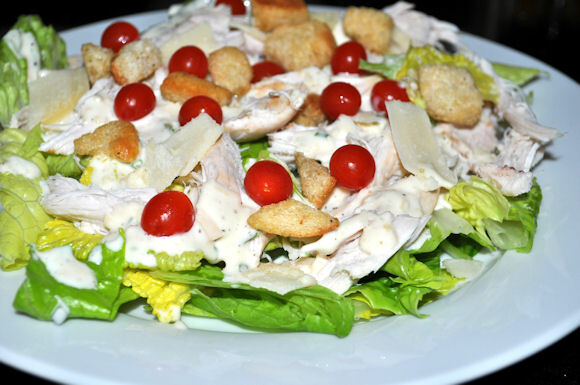 I think there are dozens of caesar salad recipes, and I am convinced they all depend on the type of caesar salad dressing recipe. Wash and make a bed with the lettuce. Simply sprinkle on the chicken, croutons and parmesan shavings. I was lazy and used a pre-bought, but if you don’t have a dressing to hand, make one. I wish I had made mine as the bought one was too vinegary for my taste. Crush a garlic clove (or use ground garlic if you don’t have any). Add two teaspoons of ground parmesan or 10g grated parmesan. If you like strong cheese, you can up this to double. Mix it into 4 – 5 tablespoons of mayonnaise. Add the finely chopped chives. Grind a teaspoon of peppercorns into the dressing. Add 1 – 2 tablespoons of white wine vinegar until the dressing is pourable. Add tomatoes or tomberries to the top of the salad. Home made or bought dressing is fine. It’s also nice with a few bits of cooked bacon added. « Caught. I’m a Fraud and I’m a Liar. This post really made me want it right here right now 🙂 Unfortunately, I must wait a couple of hours, the lunch time hasn’ t arrived yet. I’ ve never heard of the tomberries, thanks for the great inspiration!